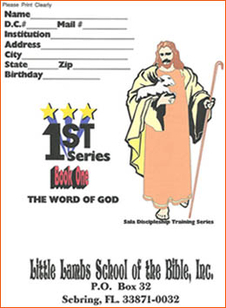 The Little Lambs School of the Bible Discipleship Training Course is an intensive correspondence Bible study course available, for free, to any inmate who may be interested. See Prison Programs for enrollment form. Our Bible study course consists of a series of 16 separate lessons. These studies range between 9-32 pages in length. Each page takes our students to various books and verses within the Bible. Each lesson requires writing and researching Bible verses, ensuring that every student handles and learns the Word of God. Our Correspondence Bible Study Program is keyed to the King James Version of the Bible. If this is unavailable to the inmate, he may request a student bible. Each and every scripture verse is checked for accuracy and completeness by our army of volunteer graders. The graded lesson is returned to the inmate with the next lesson. All assignments/lessons must be completed for graduation. We also will help inmates who are indigent by providing a self-addressed stamped envelope to return each lesson for grading. power they have never known before. Each student enrolled in our Bible study program receives personal attention by way of comments, encouragement, cards, and love. A certificate of completion is rewarded after every 4 lessons. After an inmate completes the 16th and final study, he or she will receive a letter of congratulation and a graduation diploma, as well as a new study Bible, as a gift for their faithfulness. Graduation can take up to 2 years, though the average student graduates after 18 months. This time is used to disciple, mentor, and teach. Little Lambs School has had between 2,000 to 4,000 active students in over 700 penal institutions across America. Our enrollment fluctuates as students enroll and graduate throughout each year. As of January 2017 we have 2,309 students enrolled in 738 institutions.